The Dragon Fire Rechargeable Stun Gun packs a powerful punch, smacking down bad guys with 650,000 volts of electro-devastation. Small enough to conceal in the palm of your hand, they won't know what hit 'em. And, you can blind them first with its built-in LED flashlight. But wait a minute here. 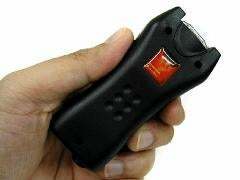 I've never seen a stun gun this cheap.